„In the realm of psychoactive plants, Christian Rätsch is the world’s most knowledgeable person. 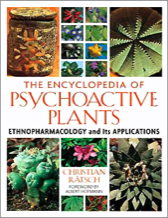 Full monographs on 168 of the most well-known psychoactives and minor monographs on 135 lesser known plants. 942 pages, lavishly illustrated with 670 black-and-white illustrations and 800 color photographs – from the author’s extensive fieldwork conducted around the world.